Hot Melt waterproofing system for use on zero falls and flat roofs in either an inverted roof specification, a green roof, on podium decks, balconies, walkways or a protected roof specification. Suitable for refurbishment, new build and green roof applications. 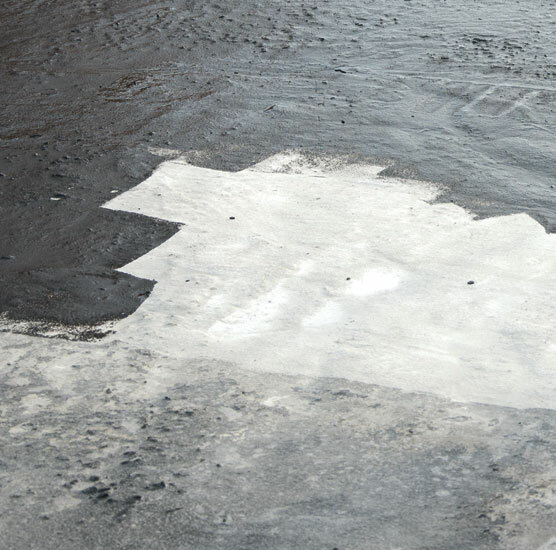 PermaQuik PQ6100 provides the main waterproofing protection to any number of building types. 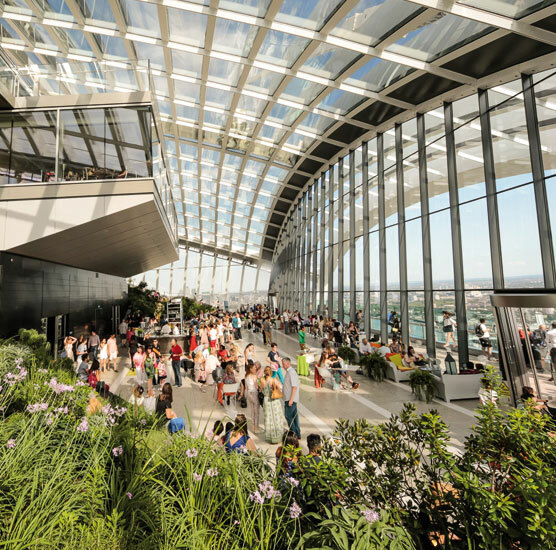 Routinely specified as the preferred roofing solution In Inverted Roof and Zero falls applications, beneath green roof systems, on ground floor plazas and in areas where long term weather tightness is a necessity. PermaQuik PQ6100 is BBA Certified to last the life of the building. Suitable for new build and refurbishment applications over numerous deck types. 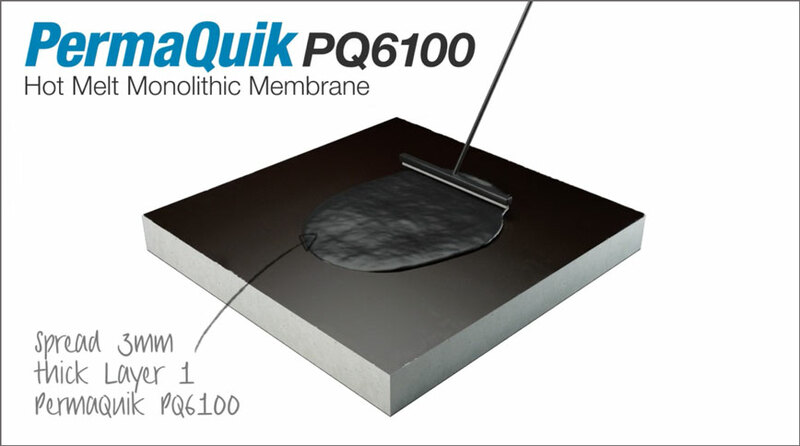 PermaQuik PQ6100 is a one part, hot applied, seamless rubberised self-healing Hot Melt Monolithic membrane roofing system membrane. 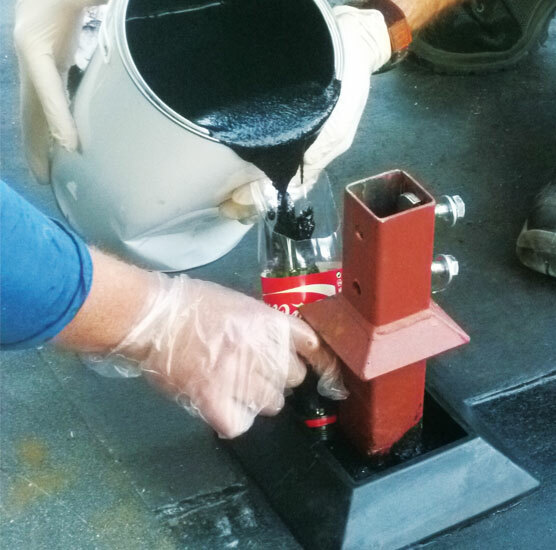 Manufactured in the UK from bitumen, natural rubbers, and a blend of polymers PermaQuik PQ6100 combines excellent waterproofing performance with toughness, flexibility, and strong adhesion to a variety of substrates. 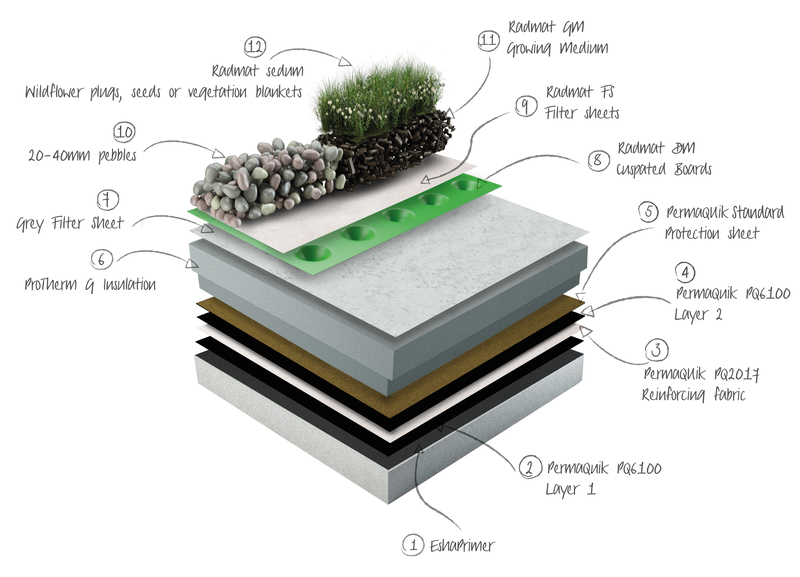 PermaQuik PQ6100 can be installed with zero falls and is BBA Certified for ‘lifetime of the building’ in protected (inverted) roof application, including green roofs. 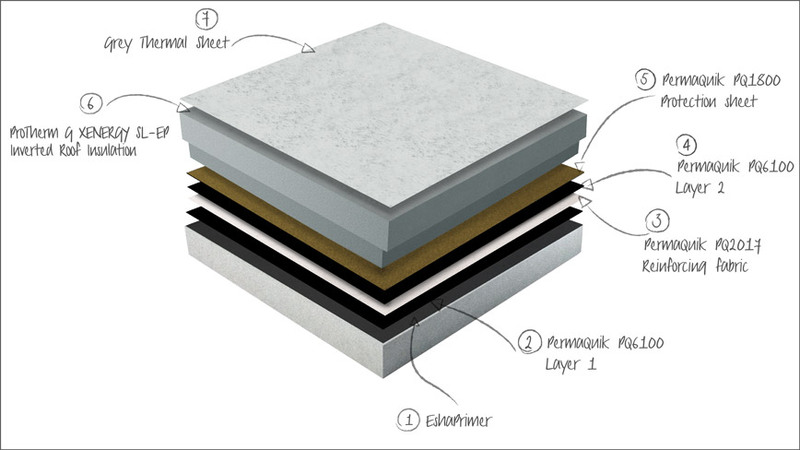 ProTherm G provides the highest thermal performance per mm of any XPS insulation, and is fire resistant. ProTherm Quantum VIP provides the thinnest inverted roof system in the world, whilst meeting the requirements of Building Regulations Part L, Part M and NHBC Chapter 7.1. 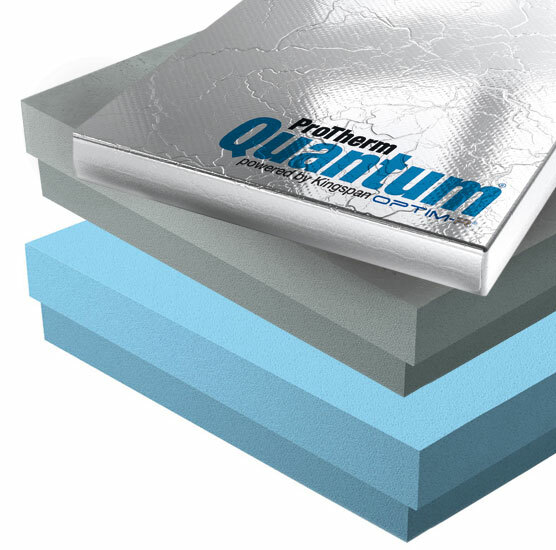 Read more about the guaranteed range of ProTherm insulants here. MedO Green Roof Systems comprise a range of extensive, wildflower, biodiverse and intensive green roof systems that provide a range of environmental, aesthetic, amenity and performance benefits. Fully bonded inverted living green and biodidverse roofing systems including zero falls applications. Suitable for green roofing in both new and refurbishment applications over a variety of existing waterproofing and deck types. PermaQuik PQ6100 is applied in 2 layers each a minimum 3mm thick encapsulating a polyester fleece. Once installed an Access or Protection sheet is applied depending on the surface finish specified. Read more about PermaQuik here. In a Refurbishment Overlay system the existing insulation is left in place to provide thermal performance. 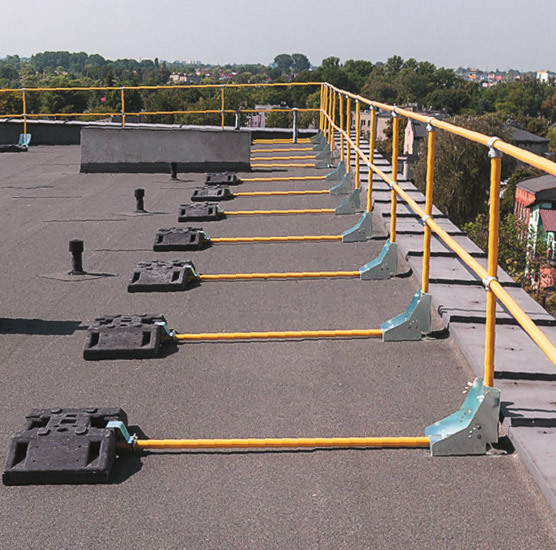 In an Upgrade system a range of ProTherm insulants are available to suit different application and performance demands, all covered by the unique Radmat guarantee. Read more about ProTherm insulants here. Structural concrete decks can be classified as either reinforced (cast in-situ), precast, pre-stressed or lightweight aerated. Timber decks can be manufactured from either plywood or Oriented Strand Board (OSB). Read more about deck options here. ProLight, ProGlaze and ProTube rooflights are suitable for refurbishment and new build applications. 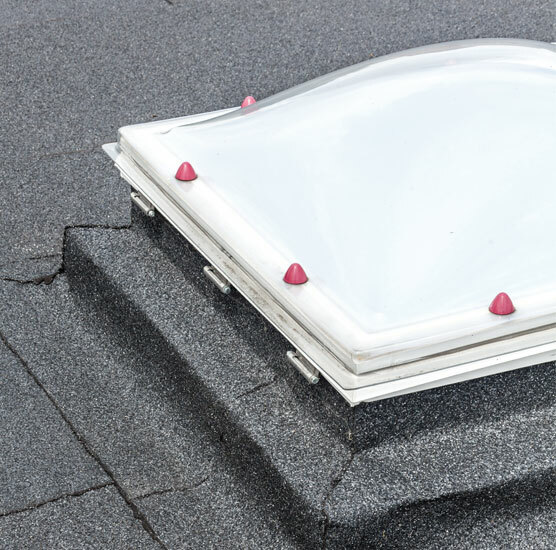 ProLight roof lights are manufactured in a variety of shapes and sizes with either extruded polycarbonate or flat glass tops. 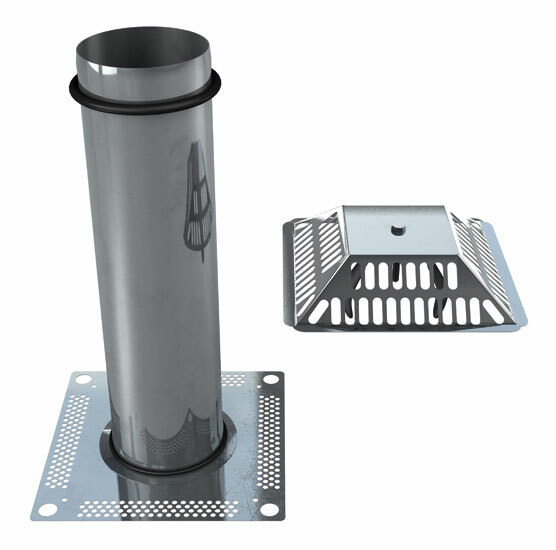 The ProFlow range of rainwater outlets provides a variety of solutions for roof and balcony drainage including overflows. Complementing the ProFlow range of rainwater outlets is a range of leaf guards of different shapes and sizes. Radmat’s roofing systems can only be installed by our Approved Contractors, companies that are specialists in the roofing sector by one of our Area Technical Managers. To find your local Area Technical Manager click here or email techservices@radmat.com.